'Man is a mortal being', however, those who through their efforts work for the well being of their relatives, friends, acquaintances and the society at large, are remembered for a long time, even after they depart to heavenly abodes. Mir Khalil-ur-Rahman, the founding father of the Jang Group of Newspapers, during his journalistic career which is spread over more than fifty years, succeeded in registering his contribution in almost all fields. Mir saheb was admired by many. His long list of admirers include well known personalities from Jamiluddin Aali to Nisar Ahmad Zuberi, Qutbuddin Aziz to Farhad Zaidi and S M Fazal, Shamshad Ahmad to Yunus Riaz. All these personalities have paid tributes to Mir Khalil-ur-Rahman on the occasion of his 16th death anniversary, which will be solemnly observed on 25th January, 2008. Veteran banker, celebrated poet, popular author and prolific writer (like Agatha Cristie) Jamiluddin Aali said that Mir Khalil-ur-Rahman was the product of several special factors of his time. It was a very particular time in history, when Mir saheb embarked upon his business in the capital of the then British India. At that time the struggle by the All India Muslim League for the Pakistan Movement was at its peak. This movement was opposed by the Indian National Congress led by Pandit Jawaharlal Nehru and his colleagues. Mir saheb started his professional career with the 'Daily Jang' in Delhi. He was a very talented man with a mission, since he started his newspaper to aid the liberation of India from the British yoke and the creation of a separate homeland for the deprived Muslims of the sub-continent under the leadership of the Quaid-i-Azam Mohammad Ali Jinnah. Former Senator Jamiluddin Ali who had been very close to Mir saheb has been a regular writer in the 'Daily Jang' for several decades. Talking about his personal experience with Mir saheb, Aali said, "Mir saheb allowed his columnists to be completely free, almost completely. They could write against the ministers, presidents or the policy of the country or any other institution and he would not interfere". "However, if the situations demanded or he was pressurised by the government in power, Mir Saheb would then call his executive editor and say "Yar Yousuf Siddiqui Saheb, zara sauch samajh liya karo, akhbar chalana hai (Please try to understand that we have to run our paper)" but MIR saheb would never say that something wrong had been published. ", says Aali. Aali said that the Daily Jang's office was more than Mir saheb's second home. Gradually and slowly, his paper gained importance and he started meeting VVIPs from other countries. When the President or Prime Minister of Pakistan went abroad for official trips or when the foreign dignitaries visited Pakistan, Mir Khalil also got the opportunity to meet all these people thanks to his publication the 'Jang' which was at the peak of success. His beat reporters were assigned to cover all such events, despite that he covered the event himself. Another important quality of Mir saheb was his capacity to manage money. Aali was associated with him for over a period of four decades and during this period he never saw him waste money. A particular trait of Mir saheb, which Aali appreciated, was that he gave very strict training to his sons, Mir Javed-ur-Rahman and Mir Shakil-ur-Rahman. He constantly administered their work. During the office hours he treated them like employees and did not mix his personal relations with his professional life. It was this training, which helped Javed and Shakil, achieve success at a very young age. Modern Urdu journalism owes a lot to the few stalwarts like Maulana Abul Kalam Azad, Maulana Mahboob Alam and Maulana Zafar Ali Khan. All of these made lasting contributions, which helped Urdu journalism become what it is today. Prominent educationist, writer, author and intellectual Prof Dr Nisar Ahmad Zuberi, who persued journalism at a young age, expressed his views about the king of the 'Jang' empire, Mir Khalil-ur-Rahman. Prof Zuberi's research proves that it was Maulana Azad who helped in the familiarisation of the use of standardised printing. Thus he helped the editors accept the fact that modernity was bound to prevail. On the other hand, Maulana Mahboob Alam attained great success by pioneering the 'PENNY PRESS' in Urdu. With his 'PAISA AKHBAR' he made the daily newspaper an affordable commodity for the masses. Maulana Zafar Ali Khan attracted the masses with his original journalistic poetry. He is known to have electrified the people with his interesting and highly charged poems like "Apni dokaan barha lo lala". All these three personalities excelled in pre-Pakistan Urdu journalism. Hence, they are rightly considered the pillars of the Urdu press. History will always bear witness to their greatness. Post-Pakistan Urdu journalism since 14th August 1949, however, is a different story altogether. This period is dominated by Mir Khalil-ur-Rahman's achievements. His humble newspaper, which was almost a non entity in the undivided India, was destined to develop into an empire of lasting strength. Zuberi says that with his untiring efforts as an editor, an administrator, a public relations officer, a human resource expert, an organiser and a planner, Mir saheb has set many examples of safe, balanced and interesting journalism for the masses. He will always be remembered for his ability to build an empire of great social and political value. Nisar Ahmad Zuberi who had the privilege of serving in various capacities in Jang and also as the editor of largest circulated weekly 'Akhbar-e-Jehan' before joining the Mass Communication department of Karachi University says, that one thing which placed Mir saheb on a high pedestal, was his mission of producing a newspaper for the masses, the Ramzanis of Majeed Lahori. Quite like the Benjamin days of the 'New York Sun' (1833), Mir Khalil-ur-Rahman believed in expanding the frontiers of Urdu journalism to include every thing that may interest the common reader. May be unscientifically prepared, but he had a clear profile of a typical Urdu newspaper reader in his mind. Mir saheb undoubtedly had a unique acumen to save the newspaper from harsh government actions and at the same time ensured that it remained popular among the masses. It was common for all seniors like Prof Zuberi, who served the Jang group from 1965 to 1984, to come in contact with Mir Saheb a couple of times daily since he believed in staying in close contact with his employees. Pakistani newspapers, during that period had to brave intimidation almost everyday. From Ayub Khan to Zia ul Haq, almost all the rulers and top bureaucrats were keen to pressurise 'Jang' into following the officials' line. In those difficult days, 'Jang' had to walk on the tightest rope without forgetting the demands of its hundreds and thousand of readers. But it was Mir saheb's balancing expertise that saved his newspaper from the wrath of the likes of Nawab Amir Mohammad Khan of Kalabagh, the powerful governor of West Pakistan. In this regard, senior journalist Syed Mohammad Taqi wrote editorials with non-committed excellence and Iftikhar Ahmad Adani and others like him taunted these kinds of editorials with their hilarious comments like "Agha Taqi key bagh mein kawwa halal hai." Qubuddin Aziz who is a senior citizen, widely respected intellectual, a journalist and a former diplomat has been associated with Mir saheb since the formative years of Pakistan. Octogenarian, Qutbuddin Aziz is of the view that Mir saheb commands a position of high eminence among the builders of the fourth pillar of the state of Pakistan. 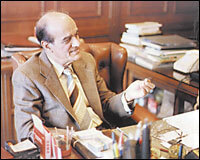 Mir saheb not only nurtured and expanded the Jang group of newspapers but also trained various teams of veteran journalistic professionals who are now serving the Pakistani press and are winning meads of praise not only for themselves but also for the man who took them under his wings and inducted them into the world of Pakistani journalism. One of Mir Saheb's unique traits was the fact that he had an excellent memory and remembered the names of many of his newspaper employees. He strongly believed that the press workers and the working journalists of his newspaper should be paid well so that able men and women with talent for journalistic writing may be drawn to join journalism in Pakistan. Septuagenarian journalist, writer, author and enlightened intellectual, Farhad Zaidi quotes Mao Tse Tung, one of the great revolutionary leaders of 20th century, "Saving a newspaper is like steering a ship caught in stormy waters". It is the captain's duty to see that the ship does not crash against the rocks or run aground. Mir saheb was the captain of "Jang" and he captained his ship with remarkable acumen, great perseverance, and a spectacular capacity for hard work. Veteran journalist and serving editor of the Premier Eveninger Daily News, S.M. Fazal was among the first few people who were employed in the popular paper since its publication in October, 1962. Fazal saheb said that, Mir Khalil-ur-Rahman was a keen collector of the gems of the journalistic world. As a result, he succeeded in forming a team of senior and qualified journalists for the Daily News, his first venture in English Journalism. Shamim Ahmed (first editor of Daily News), Khawaja Ibtisam Ahmad, Suleman Ahmad Minai, M.T. Bokhari, Zamir Niazi and Mohammad Ali Siddiqui, were among those who had been working for other newspapers prior to joining the "Jang", while S M Fazal, Wajid Shamsul Hassan, (Editor Daily News from 1968 to 1988), Mohammad Jami (Executive Editor Daily News from December 1988 to January 1990) and Ali Iqbal Siddiqui were among those who started their journalistic career with Daily News and achieved professional success to a large extent due to the encouragement and patronage they received from Mir Khalil-ur-Rahman. S M Fazal revealed that Mir saheb allowed complete freedom to the editors and their teams. He did not practice or believe in imposing his own opinions. He even respected the junior reporters and treated them as colleagues. He was able to create a great team thanks to his professional experience. Mir saheb closely monitored the news coverage of all the papers including 'Daily News' and listened to all important broadcasts, particularly Radio Pakistan, BBC, Voice of America, All India Radio etc. Along with this, he also read rival newspapers and got very angry if an important story was missed out or was not properly covered by his staff. Senior journalist and editor of the first commercial Urdu daily "Beopar" Yunus Riaz said that, Mir Khalil-ur-Rahman was fortunate enough to attract veteran journalists. Mir saheb made sure that he was involved in every facet of newspaper making, including production, coverage, display and distribution of the newspapers. It was for this reason he kept in touch with everyone, from the editor to the messengers serving the Jang group. All of his workers were free to meet him and discuss their official as well personal problems with him. Yunus Riaz who served the Jang group from 1965 to 1990 and retired as an executive editor said that, Mir saheb covered every important function himself and also took notes of the speeches made. He asked his editors to send him the report filed by the beat reporters and he sent it back to them after adding points that had been missed out by the reporter. Shamshad Ahmed consultant, Federal Tax Ombudsman secretariat, had an association with Mir Khalil-ur-Rahman for a long time. He says, that Mir saheb is one of those memorable personalities who are not only loved in their life time but are also remembered even after their departure to heavenly abodes. Mir saheb's old friends still cherish the good old days that they spent with him in Pakistan and abroad.